The boss has instilled a work ethic into his squad that means they don't give up and last night they got their just rewards after winning a penalty shoot out against Crystal Palace. 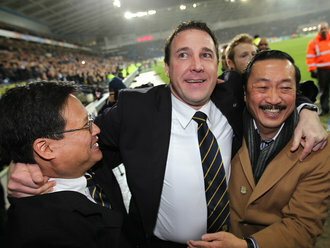 Malky said: "I was delighted with the way we went about our business. I was very proud of them. We started the game on fire. "The early goal calmed everything down and allowed us to probe. It calmed the crowd down and let them attack the game. It was a fine night's work. "When Aron Gunnarsson hit the bar with the last header of the tie you do think it may be one of those evenings. "It's obviously a lottery when it goes to penalty kicks but I had great belief in their ability and spirit to keep going. "I'm delighted for the group of players, I'm delighted for the football club tonight. "You look all the way through the competition, from Oxford when we had 10 players missing through international duty to tonight where it was always going to be tough, we've shown character and spirit. "Tonight another little bit of history has been made for this football club. "It's terrific for everyone at the football club and everyone should embrace it." For every winner there is a loser. Palace boss Dougie Freedman was left to reflect on his teams effort. "I am really proud of my players and the physical output they put into the game and the desire to keep the ball out of the net," he said. "I've got to be disappointed in the short-term, but in the long-term you can see what we're trying to do. "We have won a lot of hearts tonight with the way we performed in a fantastic cup tie. "It's just unfortunate we didn't get that goal. We showed some fantastic pace on the break but it just wasn't to be."